Norman Carter Godfrey was born in Yeovil in 1882. He was the son of ironmonger William Gidley Godfrey (b1845) and Anna née Aplin (1849-1941). William and Anna had four children, all born in Yeovil; Stanley William (1875-1943), Olive Mary (b1877), Norman and Cecil Ewart (1889-1954). In the 1891 census William and Anna, all four children, an ironmonger's assistant and a general domestic servant were all living at 23 Market Street. By the time of the 1901 census the family had moved to The Avenue. William and his eldest son Stanley were listed as hardware merchants while 19-year old Norman was listed as a hardware assistant. By 1914 Norman and his brother Stanley were running the ironmonger's hardware store in Middle Street. At the outbreak of war, Norman enlisted at Yeovil along with several of his friends. He initially joined the 6th Battalion, Somerset Light Infantry although his Service Number is unknown. He was transferred to the Motor Machine Gun Corps and left for Flanders in early 1915. The Heavy Section of the Machine Gun Corps was formed in March 1916, becoming the Heavy Branch in November of that year. Men of this branch crewed the first tanks in action at Flers, during the Battle of the Somme in September 1916. In July 1917 the Heavy Branch separated from the MGC to become the Tank Corps, later called the Royal Tank Regiment. It was probably at this time that Norman, having seen much trench fighting on the Ypres salient, transferred to the Tank Corps. He returned to England and was commissioned as a Second Lieutenant. In the early spring of 1918, at Christchurch, Norman married Georgie Twelves. Returning to the Front, he served in 'E' Battalion, Tank Corps (re-titled 5th Battalion in 1918). 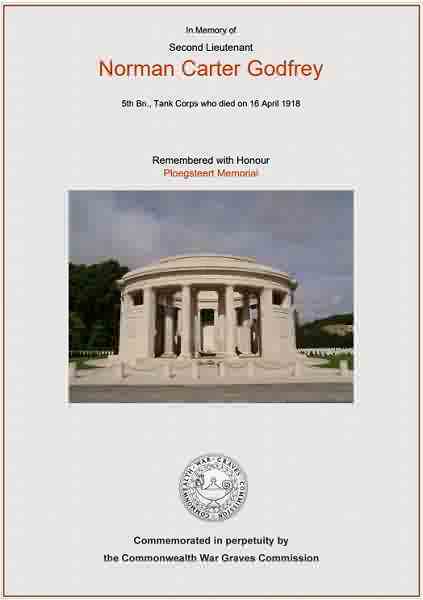 Norman Godfrey was killed in action on 16 April 1918, just weeks after his wedding. He was aged 36. The Western Gazette, in its edition of 26 April 1918, reported "Lieutenant Norman Godfrey of the Tank Corps, second son of the late Mr W Godfrey, is reported killed in action last week. At the outbreak of war he was in partnership with his brother in the business of ironmongers &c., in Middle Street, and with several friends joined the ranks of the 6th Somersets. With them he later joined the Motor Machine Gun Corps, and with that unit went to Flanders in the early part of 1915. He saw much service in the trench fighting in the Ypres salient for many months, and ultimately came home for a commission, being gazetted in the Tanks Corps. He went out again some months ago and had been in many fights with his tank, and recently had an extraordinary escape. The late Lieutenant Norman Godfrey had many friends in the town and neighbourhood, who will hear of his death with the keenest regret, and much sympathy has been expressed with his widow - he was married only a few months since - and other relatives." Norman is remembered in Panel 11 of the Ploegsteert Memorial, Hainaut, Belgium, and name is recorded on the War Memorial in the Borough. The Commonwealth War Graves Commission certificate in memory of Norman Godfrey.